As a boy whose father fought in the Navy during World War II, I grew up with a powerful sense of loyalty toward America. I was also fascinated with anything related to the armed forces: uniforms, ranks, flags, anything. Also superheroes, but that’s neither here nor there. It comes as no surprise that I was also a rebellious kid who insisted on doing things his own way. That did not go over so well with my teachers or my father — a strict disciplinarian. I grew up feeling as if I was always fending off adults who sought to tell me what to do and how to behave. My mission in life was to get them off my back. To be free of oppression, as I saw it. “I recollected that her eye excelled in brightness, that of any other animal, and that she has no eye-lids. She may therefore be esteemed an emblem of vigilance. She never begins an attack, nor, when once engaged, ever surrenders: She is therefore an emblem of magnanimity and true courage. As if anxious to prevent all pretensions of quarreling with her, the weapons with which nature has furnished her, she conceals in the roof of her mouth, so that, to those who are unacquainted with her, she appears to be a most defenseless animal; and even when those weapons are shown and extended for her defense, they appear weak and contemptible; but their wounds however small, are decisive and fatal. Conscious of this, she never wounds ’till she has generously given notice, even to her enemy, and cautioned him against the danger of treading on her. 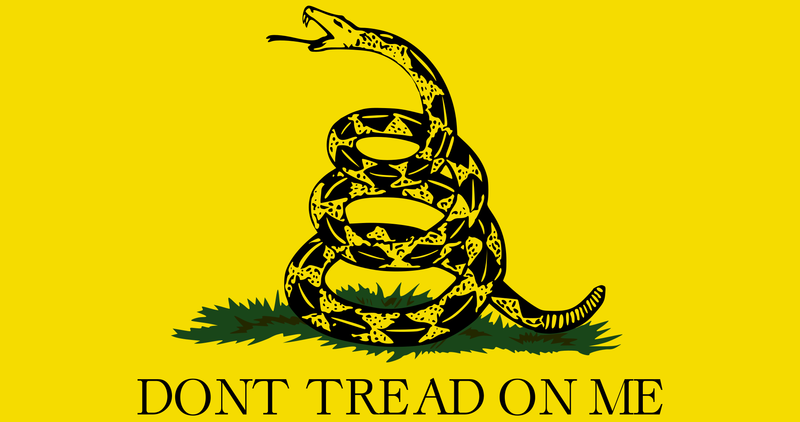 Could it be coincidence that the Gadsden flag has also come to symbolize the modern libertarian movement, which, as you probably know, I embrace? Or that rattlesnakes are all over my property in the Santa Cruz Mountains south of Silicon Valley? I nearly stepped on a huge one the other day. She was coiled and ready, but sure enough, she gave fair warning and did not strike. I’ve spent quite a bit of time traveling around and doing business in dozens of countries – some remarkably beautiful with wonderful people – but America will always be my home for one simple reason: I have always felt the deepest connection with her principles and her way of life. On every July 4th, I have two thoughts: God Bless America and Dont Tread On Me.